Is there a Fun Bunch in your area? Would you like to have one? These are not official spouses' clubs but are loosely organized groups, open to all spouses of active duty, retired and deceased Supply Corps officers, with an emphasis on fun. Sharing experiences, getting to know each other and the community, and establishing or renewing friendships are all encouraged. It just takes a little initiative on a few individuals' parts to call together some spouses and start spreading the word. Hampton Roads, Hawaii, Mechanicsburg and San Diego all have active groups meeting at this time. You can find links to these clubs on their respective Chapter pages on the Navy Supply Corps Foundation website. 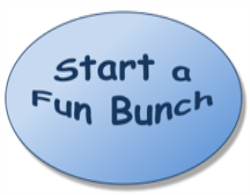 For more information about getting a Fun Bunch started in your area, contact Gracie Dziewiatkowski at scspouses@usnscf.com. Gracie is the spouses' representative on the Foundation Board of Directors and would be happy to help you get a group started in your area.